& GET A FREE UNA t-shirt! We cannot send a t-shirt without a valid address. The University of North Alabama's English as a Second Language (ESL) program will help you achieve your goals. We offer high quality instruction and personalized service for an affordable price. Through conditional admission, you can begin study in the US while you learn English and transition to academic studies easily and quickly after finishing ESL. The University of North Alabama prides itself on strong academics supported by a dedicated faculty and staff. Toward that end we offer a diverse range of undergraduate and graduate programs coupled with excellent academic support services that meets the educational and career goals for all students. Our 275+ full-time faculty have as their highest priority serving as advisors and mentoring to the nearly 7,000 students who make up the student body at UNA. The University of North Alabama offers courses of graduate study leading to degrees and/or professional certifications, so our students may increase their knowledge, further their careers, and succeed in their fields. Graduate degrees are offered in various programs and concentrations. The programs of graduate studies are offered by the University through its College of Arts and Sciences, College of Business, College of Education and Human Sciences, and the Anderson College of Nursing. As a public institution of higher education, the University of North Alabama provides quality education at an affordable cost. Generous scholarships from the University and private funds make the cost of attending even more affordable. Qualified international students are eligible for a variety of scholarships ranging from $3,000 to $6,000 per academic year. The scholarships are disbursed in two equal payments for fall and spring semesters. 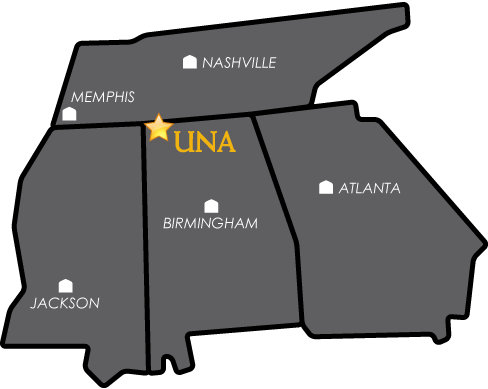 Academic scholarships are renewable based on academic performance at UNA as measured by semester GPA--2.5 for undergraduates and 3.0 for graduate students. The Academic English Program (AEP) scholarship provides free textbooks/learning materials at a value of approximately $800 per semester (two 8-week terms). The Global Learning Community (GLC), located in Rice Hall on campus, is designed as a living and learning opportunity that encourages cross-cultural learning through daily interactions, intentional learning programming, and service-learning activities. GLC members participate in Intercultural Leadership events that focus on four components of the program which are leadership, global cultures, collaborations, and community service. This scholarship is a waiver of the housing cost at Rice Hall in the value of more than $4,100 annually. Specific requirements apply. UNA students (including degree-seeking international students) are eligible for a $1,600 study abroad scholarship. Students can use the scholarship to cover costs related to faculty-led trips or a semester/year abroad at a partner university. Learn more about Magellan Exchange (pay UNA tuition, earn UNA credits), Year-Long China Study Abroad (full scholarships available), and faculty-led programs at www.una.edu/study-abroad. International students are eligible for a $500 scholarship per ESL term (8-weeks). The English as a Second Language pathway program has two terms in each academic semester. ESL scholarship is renewable based on satisfactory performance at the UNA ESL Program.